Today’s update on current WIPs… I have so many ideas that this morning I had to get up around 6am because I couldn’t rest any longer! The draught sit in the flat has gotten into a bleak state, which required a prompt intervention. Swiftly I consulted patterns, jotted down ideas (I have quite a few more), and this morning I casted on. Looking at the assorted mix of random yarns in the stash, I was actually able to put together some lovely combination of shades. 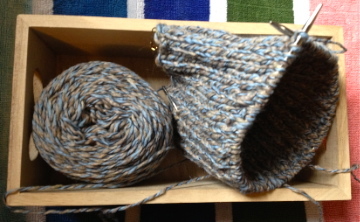 Apart from one, the other yarns have no label – though it feels like a slightly coarse wool. 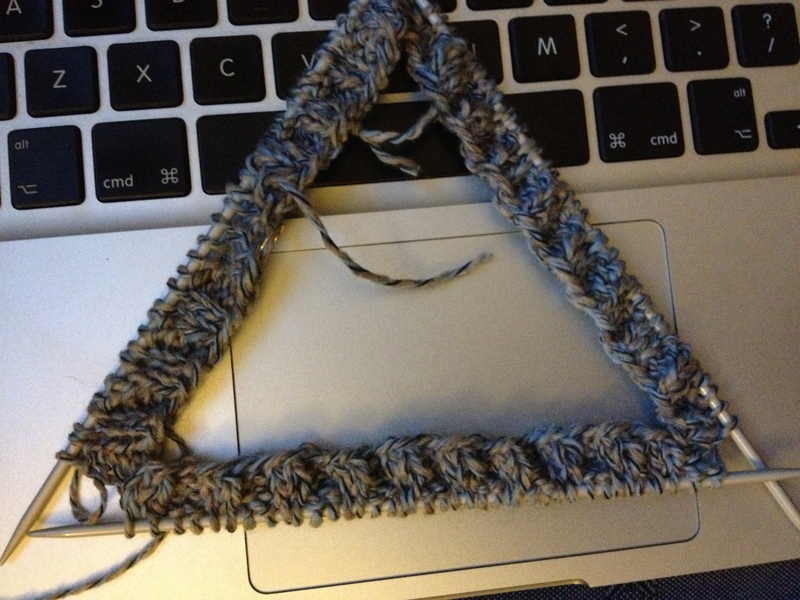 The beauty of using aran weight yarn is that progress is so immediate, which helps motivation. In the picture of the WIP, you can notice the beautiful Canadian birch needles that Joahnna from FlorePoste kindly sent me recently – I love them! Last night I moved the stitches from DPNS to short circulars (30 cm) and it made a big difference in ease of knitting: no nasty dropped stitches anymore (yay!). 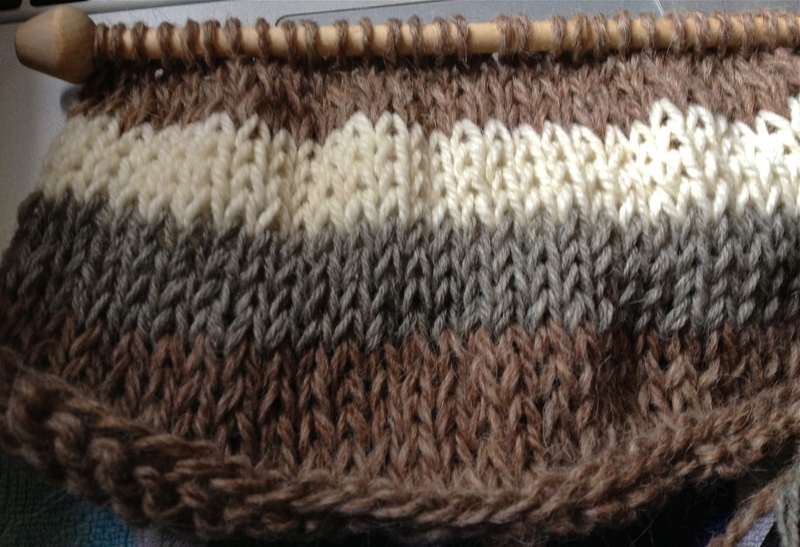 A little progress, now faring at 20 rows, not much but getting along.. The yarn is a pleasure to work with – it has a compact softness and a springy hold. 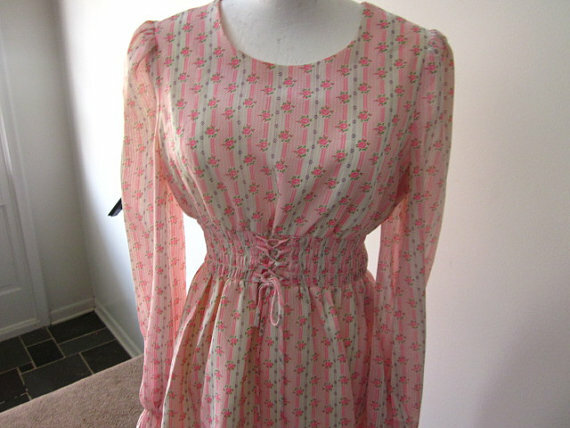 I received a delivery from the USA with a sweet floral dress (60s?) 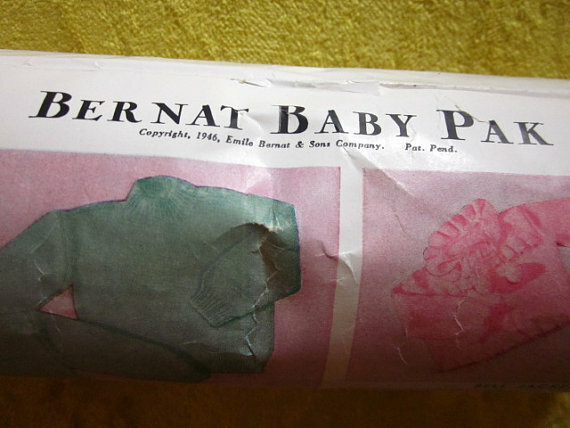 by E. D. Juniors of San Francisco and some Bernat wool kit for babies (40s-50s?). The E.D. 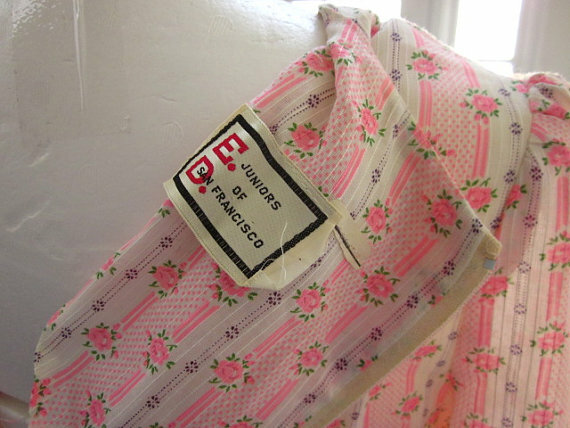 brand was apparently fairly popular in the 60s-70s – I wonder if any of the US readers know more about it? 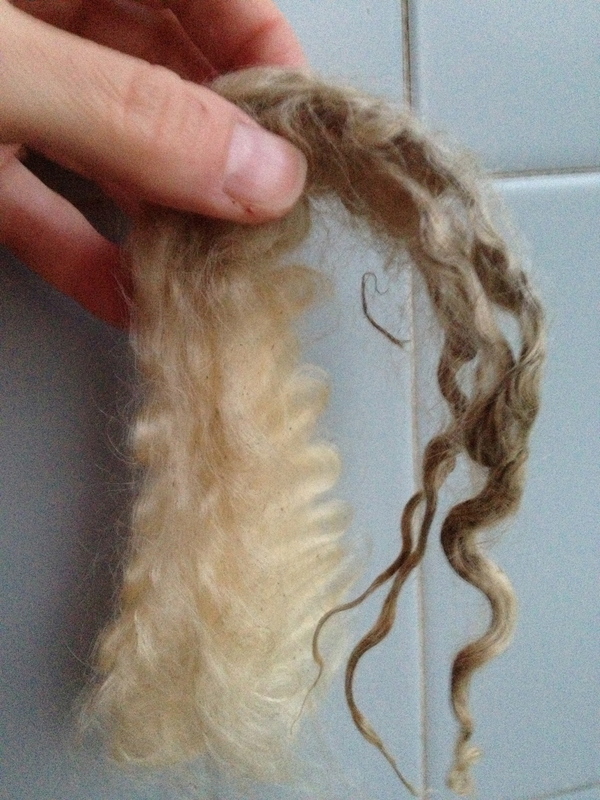 The Lincoln Longwool locks are dry! What do you think, are they clean enough? 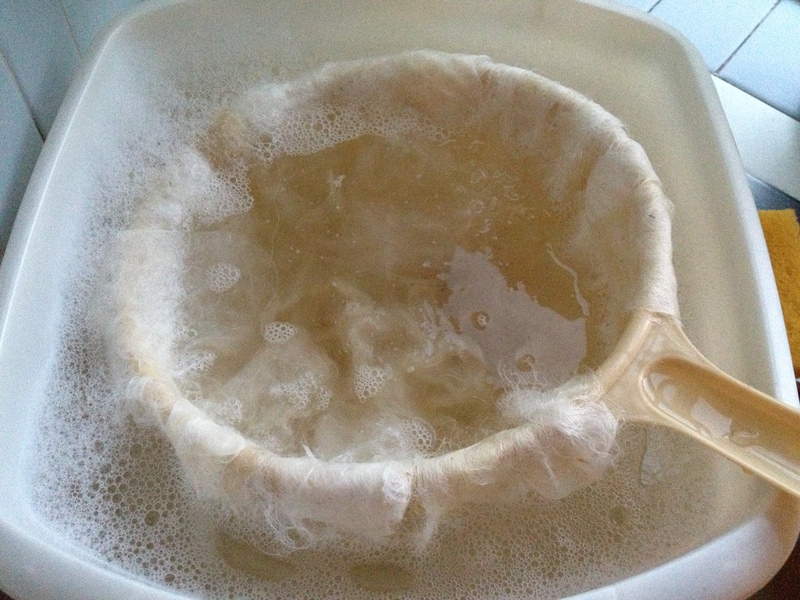 I’ve looked at and asked advice about methods to wash raw fleece: there seem to be a wealth of variations, some quite drastic – ranging from “wash in cold water” to “drop in piping hot water”, which leaves a beginner like me quite puzzled. I personally went for the cold-to-luke-warm option, paying attention to avoid any sudden temperature change that could felt the locks. I recommend a very gentle soak (2-3 times) – I add liquid detergent for delicates and a little bit of washing soda into my basin – and of course it is important not to agitate and not to give it sudden change of temperature. 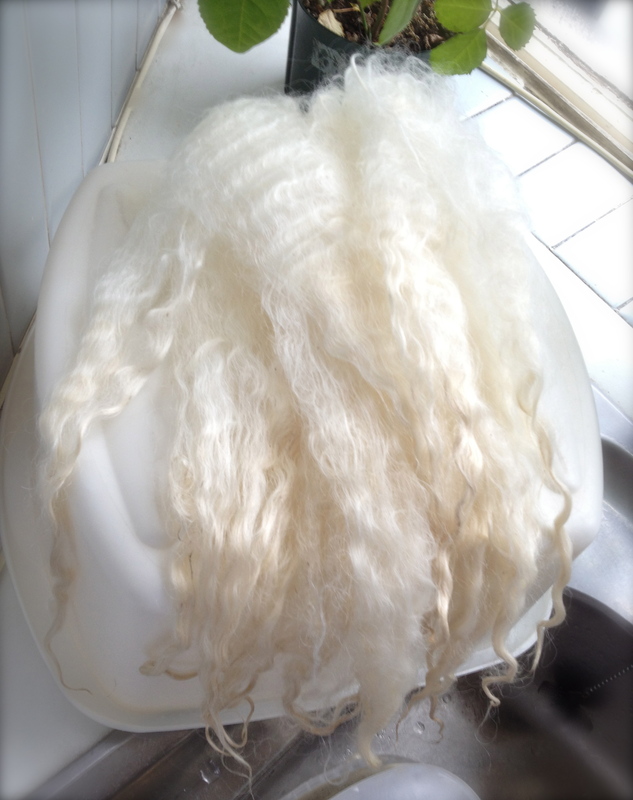 It is important to make sure it is rinsed well and hasn’t got any soap left in it – otherwise some fleeces can become brittle in a few weeks. I have tried different products to wash the wool – and I found that detergent for wool/delicate fabrics works best – you can also use usual washing-up liquid. Never use biological detergents – they damage wool, fiber and silk. If you want to preserve the shape of Lincoln locks, the best thing to do is tie them up at the tips with a rubber band and then put in the warm water with detergent – for a couple of hours, you can leave them there for the night, then change water a few times; without moving locks – this way they won’t felt. If you have a plastic basket with holes, you can put them in the basket and then in basin with water – then you just take basket out and let them drain, and put it in new water. I don’t use very hot water for washing wool as it may felt – happened to me before – just normal hand-washing temperature. 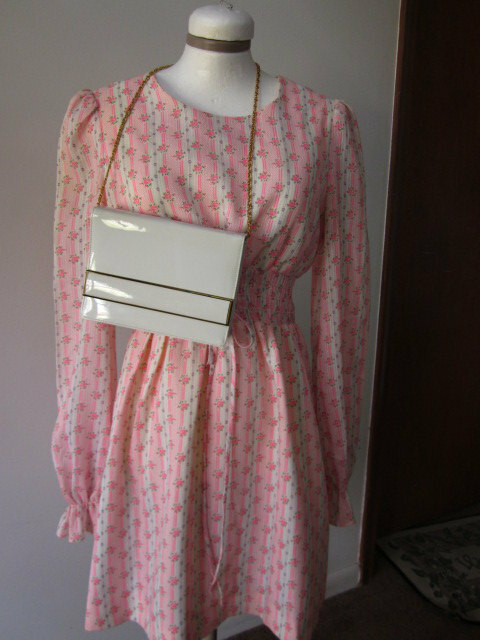 To store: it needs to be wrapped in a newspaper or -best- in a fabric bag (e.g. 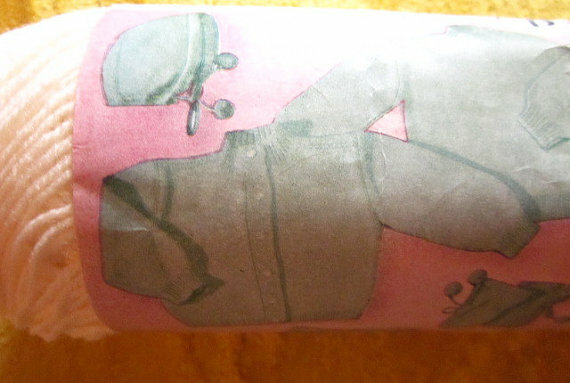 pillowcase), and have some ventilation (no tightly closed box). Wool washing advice by Serenity Farms, also highlighting the importance of a cold pre-soak. There is another very informative post on Ravelry’s Wovember group board – I will share here later if I’m given permission. 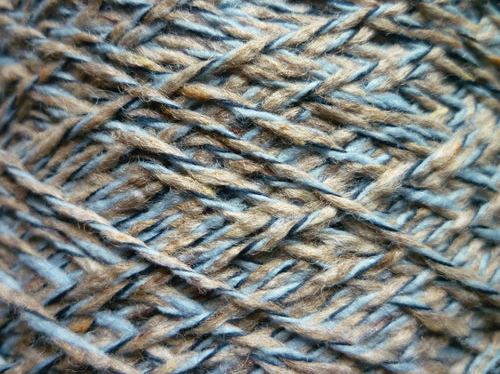 Choosing a fleece for processing and spinning by ilikecolours with practical advice on the things to consider when making your fleece purchase. Autumn has set in with its windy rainy days and the flat started featuring unwelcome draught again. I remember mumbling about draught (draft) stopper patterns a while back – perhaps it’s time to put my plans into practice? For easy care it will be done in a machine washable yarn. I think I gave up the fancy for a snake theme, it’ll be either one of the free patterns from my old post, a simple striped thing or a mono-colour with stitch decoration (got the inspiration today while reading about Ganseys). 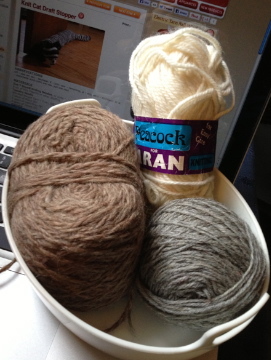 You may remember from this post that I talked about Bowmont and Lincoln Longwool. The washing of the raw fleeces has begun: being my first attempt and being new to the process, it will probably take ages to complete all; additionally I need to be careful to avoid felting. The detergent used is a natural washing up liquid by Ecover. I started by rinsing the ends under running cold water, gently opening the locks up by pulling the fibres sideway – this way, most of the vegetable matter and natural dirt came off before soaking. I didn’t take many photos because my hands were too busy, but I snapped a few before sunset. I will show more pictures once the fleece will be dry. 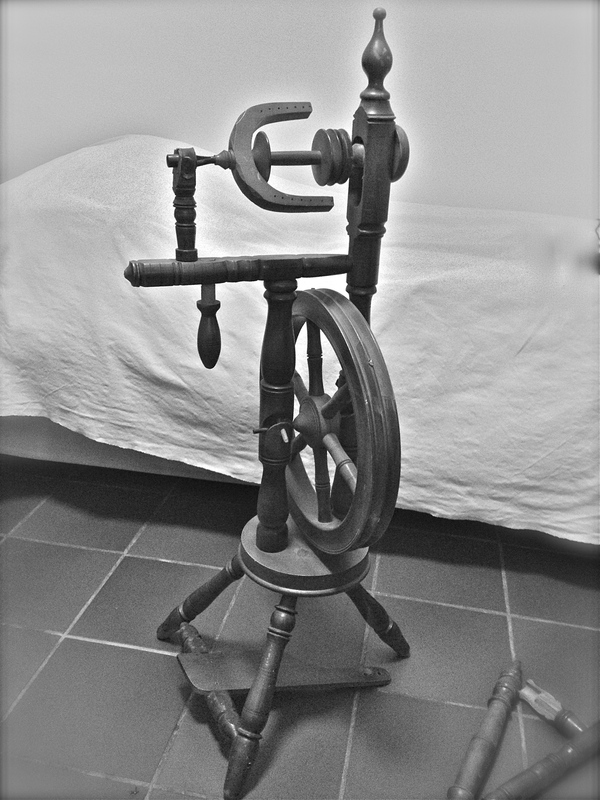 The next, I will “only” need to figure out how to use my vintage spinning wheel! I started knitting some knee caps for my father, using a vintage pattern from KnitHeaven.com. The days are growing colder and something to keep joints warm can be really useful. As a tribute to Wovember (Raverly group here), I’m using a 95/5% merino-cashmere yarn. Other vintage free patterns for knee caps on Vintage Knitting Patterns and Vintage Knits, who very kindly also offers other free vintage patterns. Programme on the worl-record attempt (shear-to-product) by a Norwegian team, thanks to the “slow TV” format now being presented on Norwegian television. I watched the first part and found it very educational as I could see it all happen minute-by-minute. Another reason to love Norway! For the moment there is no English translation, but it’s not really needed as the images talk by themselves. They’re a very interesting reading/watching if you want to start working with fibres, or are relatively new to it.